PHOTO PROVIDED A vendor pours a beer at a previous year’s Bottles and Brews event. Lovers of beer and history will be pleased to hear that this week the two worlds will be colliding in Williamsport. 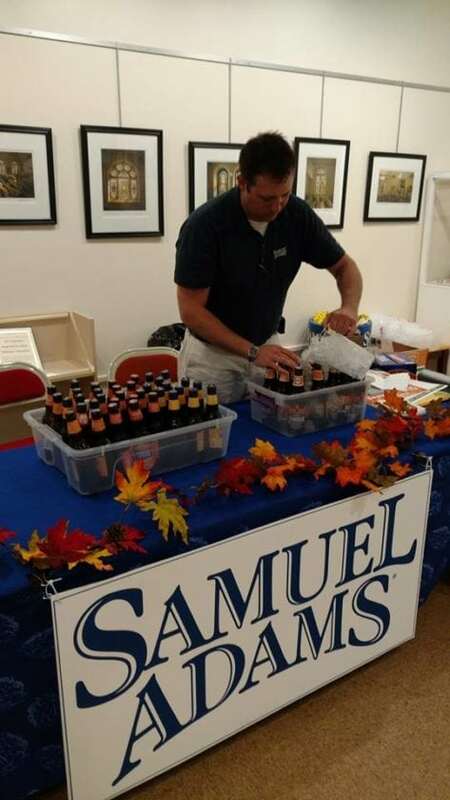 From 7 to 10 p.m. on Friday, The Thomas T. Taber Museum of the Lycoming County Historical Society, 858 West Fourth Street, will be hosting its annual Bottles & Brews VI event. Now in its sixth year, Bottles & Brews has quickly become a tradition within Lycoming County and serves as a fundraiser for the Taber Museum. The event drew over 250 people for its inaugural year in 2013, and it has grown each year since. “When we first started this, we didn’t know if it would be a success or not,” said Taber Museum executive director Gary Parks. “But each year it has gotten bigger, and we are expecting even more people this year. This fundraiser will benefit the Lycoming County Historical Society and features the opportunity to sample the wares of 19 amateur and professional brewers, vintners and distillers. Catered cuisine, raffles and admission to the Taber Museum are included in the ticket price as well. Attendees will be able to taste several craft beers and wines from the area as well as sampling the product of many local, regional and national brew masters and vintners. Expecting to participate in the event will be several area brewing companies including Neshaminy Creek, Old Forge, New Trail, Founders, Sly Fox, Straub, Penn, Yuengling and Samuel Adams, arranged through the cooperative efforts of major partner Mid-State Beverage Company. Professional craft brewers and vintners in the past have included the Bullfrog Brewery, Riepstine’s Pub, Abbey Wright Brewing, Bastress Mountain Winery and Mountain Top Distillery. Several amateur craft beer brewers of the Billtown Brewers Guild will also be present, as well as vintners ECM Cellars and Fife and Drum Winery. Alabaster Coffee and Tea Roasters will also be present. A portion of the food provided for the evening will be supplied by area restaurants and caterers. The Peter Herdic House Restaurant, Moon & Raven Public House, Erb’s Catering, Tony’s Deli, Chef Hosch & Ann Catering and Wegmans provided a portion of the food for last year’s event. “Buckets of Cheer,” featuring beautifully-crafted handmade wooden buckets, will be raffled off during the evening. The entire museum will be open for touring as well, and parking will be available behind the building or on the street. Tickets are available at the museum and on its website, and are in limited supply. For more information, call 570-326-3326 or visit www.tabermuseum.org.